Protect Your Plant From Tracking of Dangerous Materials, Prevent Employee Slipping, and Prevent Fatigue in Workers. RUBBER FLOOR MATS are a great preventative measure for UV ink and coating spill management. Using the correct floor covering in the workplace can help prevent shoe sole contamination and tracking. Use them by equipment to prevent UV materials from being tracked around the plant. You can also place them near your entrance to keep dirt and other trackable messes out of the workplace. RUBBER FLOOR MATS also offer superb cushioning and support for employees. This increase in employee comfort can even boost overall performance! 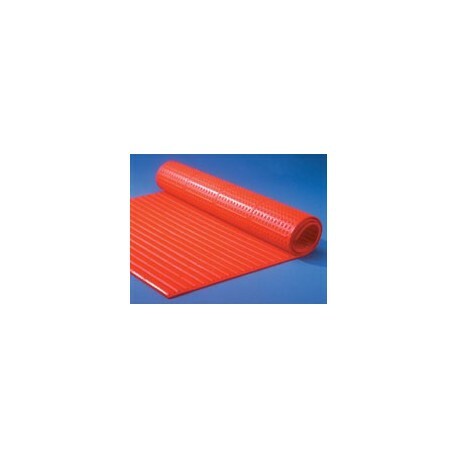 With their durable and lasting surface, rubber mats provide excellent value and quality. Rubber Floor Mats will not react to the inks, coatings, or solvents typically used for shop clean-up. And their coated rubber top provides easy clean-up of spilled materials. Sold by square foot or in predefined sizes. Our basic mat offers the most firm grip and feel. A perfect choice for general use and high traffic areas. An affordable solution for spill prevention around the plant. Our midsize mat offers ankle support for comfort. A perfect choice for high-traffic areas where quick clean-up is necessary such as the press mixing area. Our thickest floor mat offers maximum ankle support for ergonomics and comfort. A perfect choice for potentially slippery areas such as the ink mixing area. • Offered in black or with border colors. Border colors include yellow, orange, green, red, blue, or yellow & black stripes.